Side hustles have become increasingly popular. For some, an extra source of income is needed just to make ends meet. Others may just want extra cash for fun and leisure. Some might not be doing it for the money at all, but to explore a new career path or test out entrepreneurship before fully committing. Plus, side hustlers can often choose when to work, making it easier to fit it into a schedule with another job. Fortunately, finding and starting a side job is easier than ever. From driving rideshares to standing in line for people, the gig economy offers numerous ways to pull in additional income. Virtual markets, like Etsy, provide a platform for crafters and artists to sell their work. A small business can sell their products through Amazon. There are also numerous sites that post opportunities for freelancers. 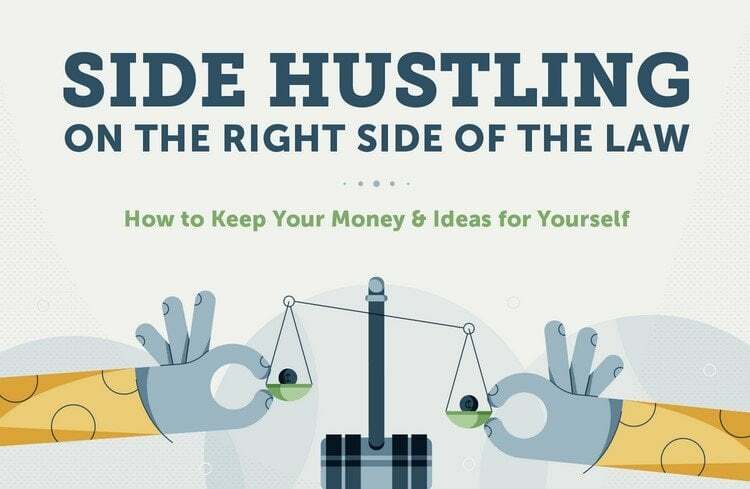 With seemingly endless possibilities, it’s not surprising that more and more people have a side hustle. A side hustle may have many benefits, but it’s important not to overlook associated legal issues. Make sure you know what might affect you. For example, it’s estimated that 18% of United States workers are covered by a non-compete clause. Doing work on the side that is similar to your duties at your primary job may put you at risk of violating this. 1. Employment contract: Most people sign an employment contract when they start working with a new employer. These contracts often include stipulations that can affect what you are allowed to do outside of the job. Before starting a side hustle, look at your employment contract. If you don’t have a copy, HR should be able to provide it to you. Non-compete – An agreement not to enter into competition with your employer. Non-disclosure – An agreement to keep your employer’s private information confidential. Invention assignments agreement (AKA intellectual property agreement) – an agreement that anything created, or improved upon, on behalf of the company will be exclusively owned by the company. 2. Taxes: Figuring out taxes can be one of the trickier parts of working for a non-traditional employer. Whether you’re doing gig work, contract work or working for yourself, there are a few things you’ll want to think about. Reporting income – The IRS requires you to report all income and pay taxes. At a traditional job, these taxes are usually taken out of your paycheck. However, this likely isn’t the case for your side hustle. Make sure you’re putting money aside for taxes throughout the year so you can afford to pay when it’s time to file. Business vs. hobby – There are different tax breaks depending on whether you claim to be running a business or hobby. The IRS has a handy guide to determine which one you should choose. 3. Loans – If you decide to take out a loan for your side business, you’ll want to minimize your risk. If your business isn’t legally separated from you as the owner, your personal assets could be at risk. It might be worth forming an LLC to protect yourself. LLC – LLC stands for limited liability company. This is a business structure where owners are not personally liable for the company’s debts or liabilities. Disclaimer – Putting a disclaimer on your blog can be used to limit your liability for how others use the information in your blog. Paid content and promotion – The US Federal Trade Commission requires that you disclose your relationship with any product you promote or endorse. This is often done by marking a post as a promotion or ad. Insurance – The major rideshare companies include insurance, but some states say that is not sufficient coverage in the case of an accident. Sales tax – Online vendors usually need to collect sales tax from buyers who live in the same state where they have a physical presence. 5. Location-specific considerations – Depending on the city and state you operate in, there may be additional laws to keep in mind. For example, leash laws can vary greatly by region. If you’re a dog walker in Tennessee you’ll need to make sure dogs are under “reasonable control” at all times. If you’re in California, a company can’t enforce a non-compete clause after termination of employment. 6. Ownership over your ideas – If you create something, whether that’s an invention, a piece of art, or a company name, you don’t want someone else using it without your permission. Below are important concepts that can help protect the rights to your ideas. Copyright – a form of legal protection to authors of “original works of authorship,” including musical, literary, dramatic, artistic and other creative works. Patent – An exclusive privilege granted to an inventor to make, use or sell an invention for a set number of years. Trademark – A word, name, symbol, or design, or any combination those, used to identify and distinguish the goods of one manufacturer from another. Whether you’re starting a side business, joining the gig economy or working on a passion project, you want your side hustle to succeed. Protecting yourself legally can help make that happen.